Successful joint use management of underground infrastructure begins with knowing which assets are in underground spaces and tracing actions to each one. In this four-part series, we are taking a look at the details of conduit vault conditions, pre- and post-inspection. The first blog in the series looked at trespass by foreign occupants in manholes and handholes. In our experience, owners are astonished to discover the number of trespassers in their underground space. They are also surprised at the amount of existing damage in their vaults when they see the results from an inventory. 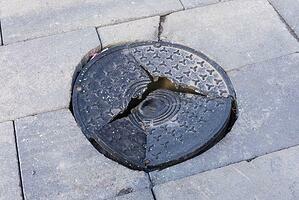 For our second article, we are looking at structural damage in manholes and handholes. Underground damage has many causes—unauthorized trespassers, improperly trained contractors, and natural wear-and-tear of vault integrity from the elements. Damage from natural disasters is common, but this is out of the asset owners’ control. Most damage occurs from trespass and hasty contractor work, which the owner is liable for. It can easily be prevented with routine maintenance and inspection. Watch the video below for a brief illustration of manhole and handhole damage. As we saw in the video, there are several types of damage. Here is an outline of how and where damage begins. Vaults deteriorate over time, whether it is manholes, handholes, or pedestals. Walls, ceilings, and columns crack and crumble. Under ideal conditions, these structures last for decades. But just like any other structure (a house, a shopping mall, school building, etc. ), if the space is not cared for, it's unlikely it will be around for very long. Environmental hazards, such as oil, heavy metals, and root intrusion can contaminate the air and water in these spaces. Such build-up leads to remediation costs, delays, and possible injury or sickness. Manholes and handholes are designed with pre-fabricated access points, called knockouts. When they are accessed from other locations, by necessity or convenience, it is called core-drilling. When done correctly, core-drilling does not cause lasting damage. Trespassers typically core-drill quickly and cheaply, to make trespass routes convenient. Roof damage occurs from a number of causes. Typically, manhole and handhole owners see roof damage as a result of wall (and structure) damage. When the walls begin to deteriorate from unsafe knock-outs, it leads up to the roof above. Roof damage and deterioration is a huge liability for contractors and linemen. If it collapses, the street or ground above it may collapse with it. Confined spaces are inherently dangerous places. Everyone wants their system to be as safe as possible. If they are not safe, owners could be held liable for any injury that occurs in the structures. When wall damage or roof damage occurs, debris falls. If the manhole or handhole has not been checked in a reasonable period of time, the debris becomes an obstruction. Field technicians can trip over, or fall onto debris, causing serious physical harm. Excessive coils left behind can also be considered debris on the ground, and these are typically left by foreign occupants or contractors. Compromised vaults can cause damage to the street above from faulty roofs and off-centered structural issues. Street damage ranges from asphalt cracks to off-centered pavement. When vaults cause noticeable street damage, the vault owner is responsible for the repaving costs. Of course, at this point, the vault would need to be replaced to keep it from disrupting the street again. Last but not least on our list is contractor damage. Contractors may be employed by the vault owner or by a trespassing company. Many telecom and broadband owners in the same area pool from the same group of contractors. Contractors are typically overworked and my be rushing from job-to-job. They may leave behind faulty work, such as incorrect core-drills that eventually cause roof damage, leading to structural damage and debris. These types of damage are against State and NESC codes. They fall into a category of violation, which we will cover in our next post. The structural integrity of underground manholes and handholes could be compromised from the discussed damage causing liability, fines from municipalities, and loss of worker time. It is in the owner’s and technician’s best interest to keep vaults damage-free and safe. Lack of underground knowledge affects the entire business from accounting and finance, to business analysts, engineering and operations. The power of good data is imperative to keeping track of assets. Do you have any stories of vault damage? Is there a specific way you keep track of assets in underground spaces? Share your thoughts in the comments. Want to learn more conduit horrors? Click here to read a few horror stories.